Think of a business where there is no interaction between the parties involved in it. There is no whereabouts about business proceedings, people involved in the business and no one gets to know who wants what. This is an example of a suspicious, chaotic, unorganized business. Therefore, it is essential that a business entrepreneur comprehends the importance of communication for business. What if a business owner launches top class products every day but and puts forth its best marketing team to bring the product in the market. At the same time, if there are no proper communication channels so as to reach out to your customers, every business strategy shall fail; because nothing but communication is the key to a successful business. It is very important for the admin or sellers to know that their business can only flourish only if the customers are happy and satisfied with the products and services. As a newbie in e-commerce, I plan to surf websites so as to get products for my e-commerce website and while surfing I come across the Webkul’s website. As I find the website interesting, I decide to visit and check out its products. I found some of the Webkul’s products useful for my e-commerce business and so I go forth and buy. Nothing is Perfect! After a few months or so I face some issue. It is obvious I would expect that I have Webkul’s back for providing me a helping hand and guide me through the query process. This is where my part as a Buyer ends and the Webkul’s role as a Seller comes to play. I reach out to the Webkul’s team with the query and their team communicates with me and provides the solution to my query. This also builds my trust in Webkul. That is why one of the most imperative aspects of any e-commerce business is communication. As technology is growing each day, so has the ways and means for reaching out to the customers. Communication channels such as Live Chat, Emails, Phone Support, through Ads etc. Amongst all these means of communication, one of the most interesting and useful ways for the customers to get in touch with the sellers and vice versa is through the simple but effective chat/ message method. Simple because one can frame the query well in words and simply send it to the sellers. It is understood well and the sellers can guide the buyers in a better way in a message/ chat system. Everything in this world has pros and cons. It is the features of any product which add on to the quality or degrades it. 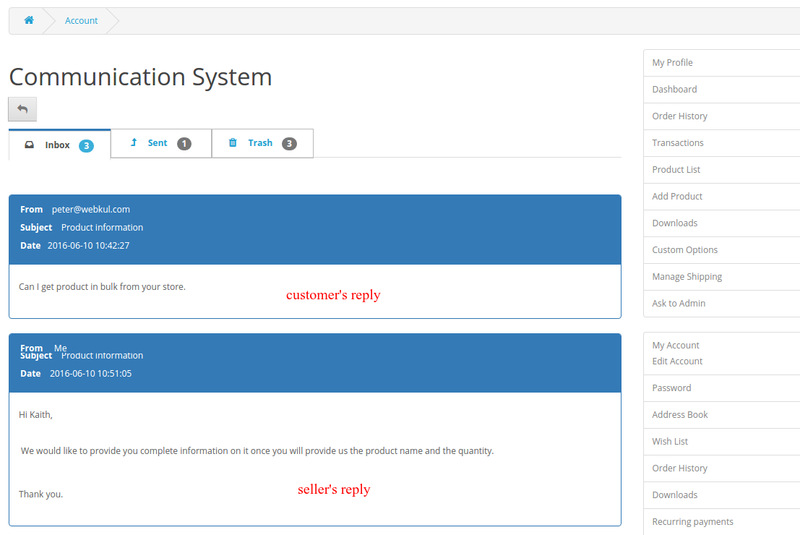 The list below depicts some winsome features of the Opencart’s Buyer Seller Communication. 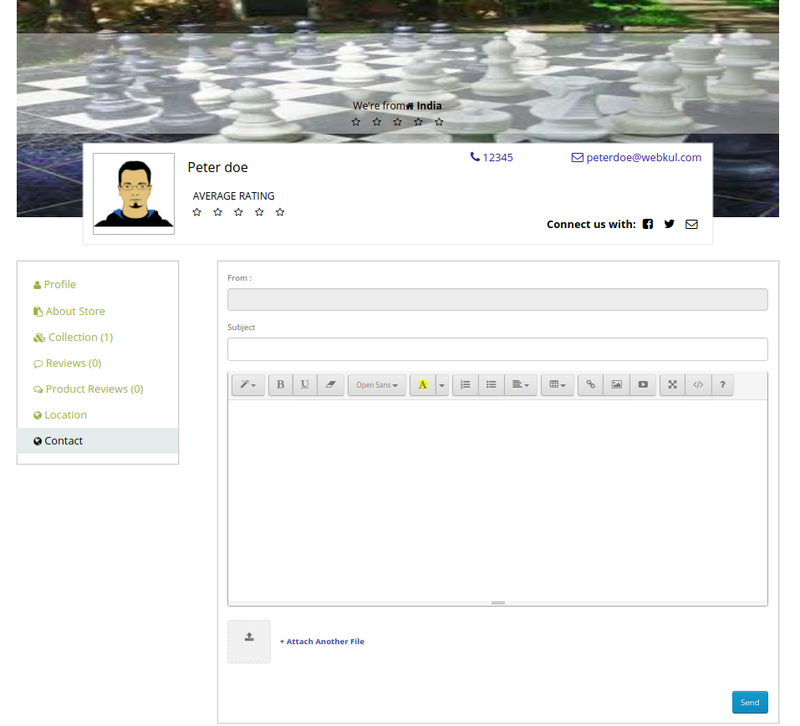 Buyer can drop product related queries for the sellers of the store through the message with ease. Sellers can send a revert for the customer’s query. If need be, both the sellers and buyers can delete an old query message. Not only text messages, but the buyers and the sellers can exchange the attachments.